A well-designed, well-operated supply chain that delivers health supplies to patients and clients who need them is critical to the success of any health system. With an electronic logistics management information system (eLMIS), logisticians can quickly access data they need to make informed decisions. Ultimately, customer service improves by minimizing losses and stock imbalances while moving public health commodities more efficiently to where they are needed most. An eLMIS can provide dashboards and detailed management reports that streamline aggregate nationwide data, making it easier for program managers, policymakers, donors, and implementing partners to process for decisionmaking. With electronic reports, automated approval workflows, and email/short message service (SMS) notifications, processing time for requisitions can dramatically decrease. 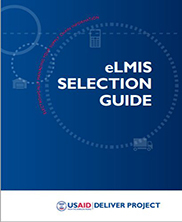 In the new eLMIS Selection Guide, you will find information about what it takes to be eLMIS ready, including profiles of three eLMIS applications developed by the USAID | DELIVER PROJECT; they are available for customized development to meet specific in-country needs.